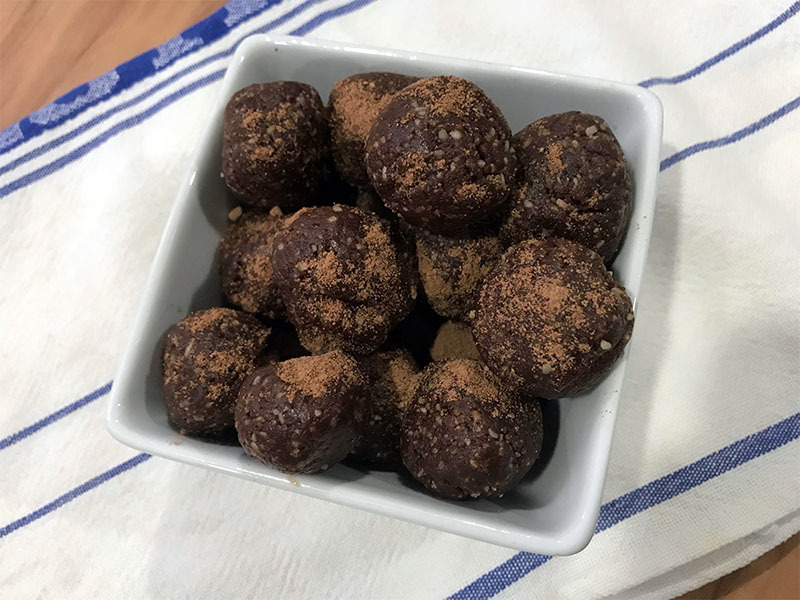 Bliss Balls are such a simple snack food, and 1 or 2 small ones are perfect for snacks on the run. Dates, tahini and sea salt blended together with a little coconut milk make a wonderful caramel. So I decided to try to use this combination to make a bliss ball. The verdict was yum by our kids and so I give you Chocolate Caramel Bliss Balls. These are nut free so perfect for lunchboxes. Enjoy! Makes about 24 small to medium sized bliss balls. * watch this facebook video of me rolling out the bliss balls – watch out for my son’s poo jokes! Is there something else I can use other than tahini- my daughter has a sesame allergy- or can I omit it? It’s the tahini in these that give them the caramel flavour. You could replace it with 100% Peanut butter or ABC butter but they wouldn’t be nut free for school. Thanks for a new recipe to try. Glad to see that my boys are not the only ones who can’t seem to get enough of poo jokes! And that I’m not the only one who hasn’t got to the shops this weekend. I noticed that your description of a caramel above the recipe includes coconut milk, but the recipe does not. So just thought I’d clarify if it should be in there or not? No this recipe doesn’t use coconut milk. The combination of the dates & the tahini give it the caramel taste. If you want to make a thick caramel sauce, use dates, tahini, pinch of salt & some coconut milk.